There are basically two methods to get to Tioman Island – by air, or by road and ferry. This is the quickest and most convenient way to get to the island from Kuala Lumpur. The flights take forty or fifty minutes, and while they are not cheap, the do represent good value for money. Be aware that the luggage allowance is small because these are not big aircraft. Berjaya Air used to operate a daily schedule from both Singapore’s Changi Airport (+65 6542 4563/9722 4356), and Subang Airport (+60 03 7847 3550) in Kuala Lumpur. Their web site address is www.berjaya-air.com for Malaysia. However, the situation changed in 2014. I was told that Berjaya Air had been taken over by another firm and at the start of the season they cancelled all flights on both routes. However, they have now reinstated the daily flights from Kuala Lumpur, but not those from Singapore. I found out in March 2015 that Systematic Aviation Services has begun a service to Tekek Airport on Tioman Island. They fly in from Subang airport, Kuala Lumpur. The flight from Subang is scheduled to depart at 10.00 am and the flight from Tekek is at 12.00 noon. The price is RYM 850.00 one way and 1200.00 return. The baggage allowance in 7 kg, and excess is charged at RYM 6.00 per kilo. Flight time is under one hour and passenger are requested to be at check in half an hour before departure. The phone number for their KL office is (+6) 03 7846 9015, and for Tekek it is (+6) 013 627 2473. I can arrange a water taxi to pick you up from Tekek Airport on Tioman, to bring you to Salang. 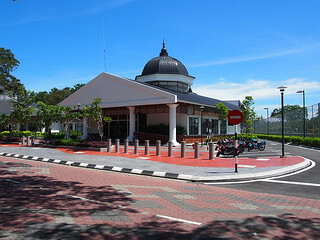 There are two ferry terminals on the mainland that provide a service to Tioman – Mersing and Tanjung Gemok. Both are on the south east coast of peninsular Malaysia. Mersing is the more popular depart point, but Tanjung Gemok has a deeper harbour so it is always easy for the ferry to get in and out. The parking is also free there! Tanjung Gemok is about an hour north from Mersing by car, next to the town of Endau. Be aware that there are two parking zones at Mersing. The area directly next to the jetty buildings, and an area slightly inland from there, which is much cheaper. The drive from Kuala Lumpur to either destination takes around four to five hours. Add an hour to that for the bus. By taxi or car from Singapore is a relatively straight forward journey. If you are coming by bus then it gets a bit more complicated. As far as I know there is no direct service from Singapore to Mersing. Instead you need to catch the bus to the bus terminal in Johor called Larkin, and then catch a Malaysian bus north to Mersing. The drive from Johor Bahru takes about two hours, so add about thirty minutes, or an hour to that for the bus. The time it takes for a road journey from Singapore to Johor depends very much on the time of day, and day of the week – the border can get very busy at peak periods! Bluewater Ferries depart from both Mersing and Tanjung Gemok, and the journey takes around two and a half hours. Tanjung Gemok is on the north side of the river next to Endau on the map above. Be aware that there are two parking zones at Mersing. The area directly next to the jetty buildings, and an area slightly inland from there, which is much cheaper. 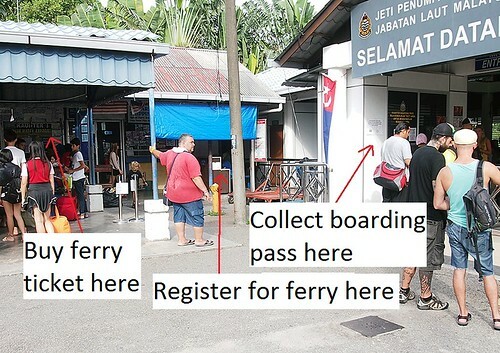 Once you get to the jetty in Mersing new comers can get a bit confused by the procedures – hence the pictures below. 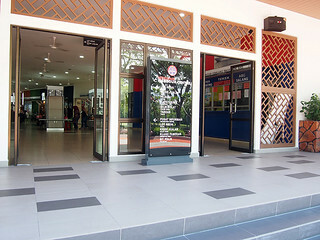 You must buy a ticket, register for the ferry, pay a Marine Park fee, and collect your boarding pass from different points within the ferry terminal. You can see the new office on the right hand. As of mid 2017 the procedures have changed. 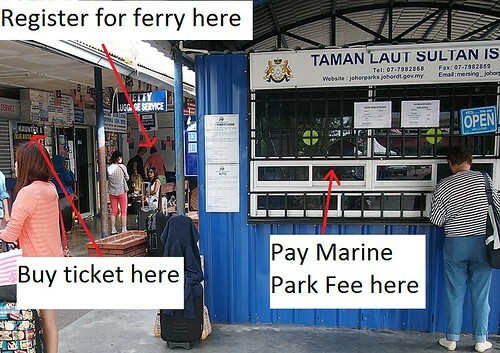 Now you no longer buy the ferry ticket in the jetty area. Bluewater have set up a new office across the road, so please ignore the photo below that indicates where to buy the ticket. They have set up shop in a new building just before you get to the jetty area. You will see the new complex as you travel down Jalan Abu Bakar. As you leave the centre of town you pass first the post office, then the sports ground before coming to the new building. All three are on your right. Just go up the steps of the first building and the new offices are on your right. The complex contains some new retail outlets and some good food outlets as well. There is also a Kluang Coffee shop there so that is something new for Mersing. Please be aware that this whole complex is not roller bag friendly. There are steps all over the place and nor ramps that I can find! Bluewater’s phone number is: 077 994811.